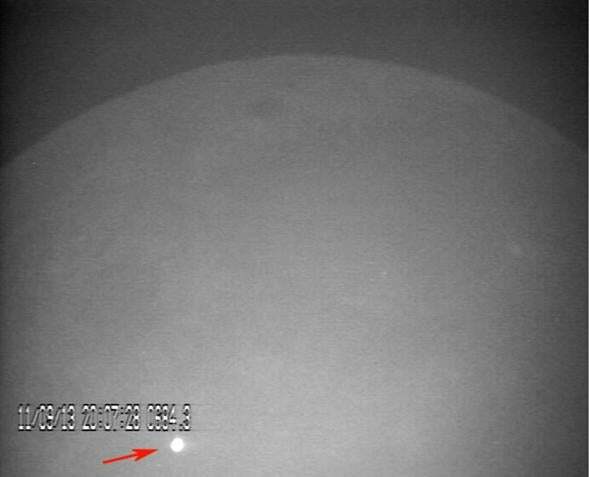 Lunar impact: Video of an asteroid hitting the Moon. 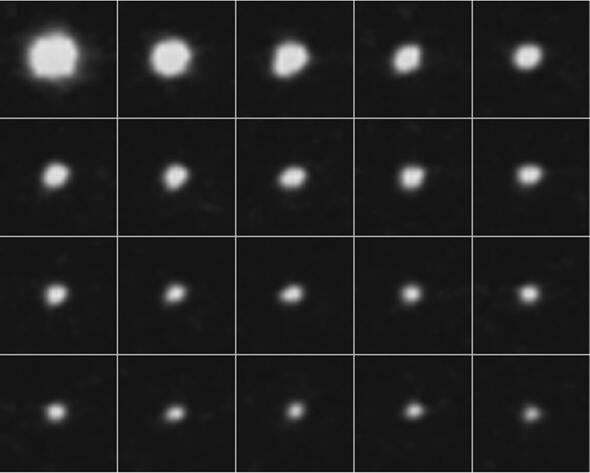 Caught on tape: An asteroid slams into the Moon! On Sept. 11, 2013, an asteroid hit the Moon. That happens all the time, but most of the cosmic debris is tiny, far too small to detect from the Earth. The video was taken using MIDAS, or the Moon Impacts Detection and Analysis System, a set of telescopes in Seville, Spain, which scan the Moon for just such an event. The astronomers also put together a longer video explaining the program and what they saw. The flash was pretty big, getting about as bright as Polaris, the North Star. If you had been looking at the Moon at the time, you would have seen it yourself! It occurred on the Moon’s unlit area, near the dark area called Mare Nubium. A similar impact happened in March 2013 and was also captured on video, but wasn’t nearly as energetic as this one. The explosion occurred because the asteroid was moving so rapidly. The energy of an object in motion depends on its mass and velocity. An asteroid hitting the Moon is typically moving at about 17 or so kilometers per second (38,000 mph)—that is, very fast. That gives it a lot of energy, and that energy is released very suddenly when it slams into the lunar surface. A sudden release of energy is what we call an explosion, so there you go. The brightness of the explosion together with the typical impact speed means the asteroid was probably about 0.6 to 1.4 meters across—somewhere between the size of a big beach ball and a decent-sized clothes dresser—and had a mass of about 450 kilograms (1,000 pounds, or half a ton). Those are estimates, however; it may have been somewhat smaller or bigger. The impact energy was about the same as detonating 15 tons of TNT. It’s not clear if this was a lone gunman, so to speak, or if it was part of a meteor shower. We get meteor showers when the Earth plows through the debris left by a comet as it orbits the Sun. The Moon gets hit by them as well, and there was a weak shower just two days before the Sept. 11 impact (the not-so-well-known Epsilon Perseids); the shower on Earth produced some pretty bright fireballs, too. The rocks in a meteor shower are moving much faster than the typical ones that hit the Earth and Moon, and in this case if it was part of the shower the impactor was much smaller, perhaps on 35 centimeters (1 foot) in diameter, the size of a basketball, and had a mass of only 50 kilograms (110 pounds). However, there’s no way to really know. A “time series” of the flash, showing it fading over several seconds. As you can see, it dimmed rapidly at first and then more slowly; the initial event was over in a fraction of second, but splashed-out molten material contiuned to glow for some time. Interestingly, the flash of light from the explosion lasted much longer than usual. The video shows it glowing for more than eight seconds, while most impacts previously seen last less than a second. This may be due to an afterglow as molten material splashed up off the lunar surface, then fell back down. Astronomers estimate the crater size as about 40-50 meters across, about half the length of a football field. So, yikes. That’s easily big enough to be spotted by the Lunar Reconnaissance orbiter, so I’m hoping we’ll see a picture of it soon (LRO did get a shot of the crater left by the March 2013 event I mentioned above). The Moon is smaller and has less gravity than Earth, so it gets hit less often than we do. Still, this event can be used to estimate how often we do get hit by objects this size, and interestingly the number matches well with what was found just a few months ago by astronomers analyzing the Chelyabinsk impact over Russia in 2013. If something this size were to impact the Earth, it would disintegrate harmlessly in our atmosphere; the event over Russia was from an object 19 meters across, mind you, and it exploded very high above the ground. For biggish impacts that can still be dangerous; the Chelyabinsk event shattered windows and injured more than 1,000 people. However, we’re hit by meter-class objects several times a year, and for the most part people don’t even notice. I love that we can do this; the advent of inexpensive but high-quality telescopes (in this case, made by my friends at Celestron) together with good electronic detectors make recording these events far easier—computers are also fast enough to analyze the data quickly too, which would be incredibly tedious for a human to perform (unless staring at a mostly unchanging view of the Moon for hours on end is something you’d enjoy). I had an idea to do this back in the 1990s, but it would have been a nightmare to set up. Nowadays, it’s far easier. And we get cool video of impacts that have a lot to tell us about the history of the Moon, and even the current history of Earth. Science! I love this stuff.